The Andes are the longest continental mountain chain on Earth and the highest outside of Asia. This chain of rocky spires forms a part of Earth’s giant tectonic recycling system. Most mountain belts in the world owe their existence to two continents colliding. 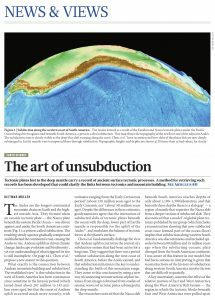 In contrast, the Andes formed while an oceanic tectonic plate was driven against and under the South American continent, through a process called subduction. The steady squeeze gradually compressed and thickened the continental crust, causing the Andes to rise. Subduction and mountain building are active today along the entire west coast of South America and give rise to earthquakes and volcanic eruptions. Andean uplift is known to have driven climate change, landscape evolution, and biodiversity. Given their geological, biological and economic importance, the Andes have been studied for centuries. Yet, our understanding of what triggered their rise is still incomplete. What exactly is the connection between Andean mountain building and subduction? The established view is that subduction to the west of South America has been continuous since some time in the Jurassic Period, but that the onset of Andean uplift is significantly younger, with estimates ranging from Early Cretaceous (~130 Ma) to Early Cenozoic (~50 Ma). 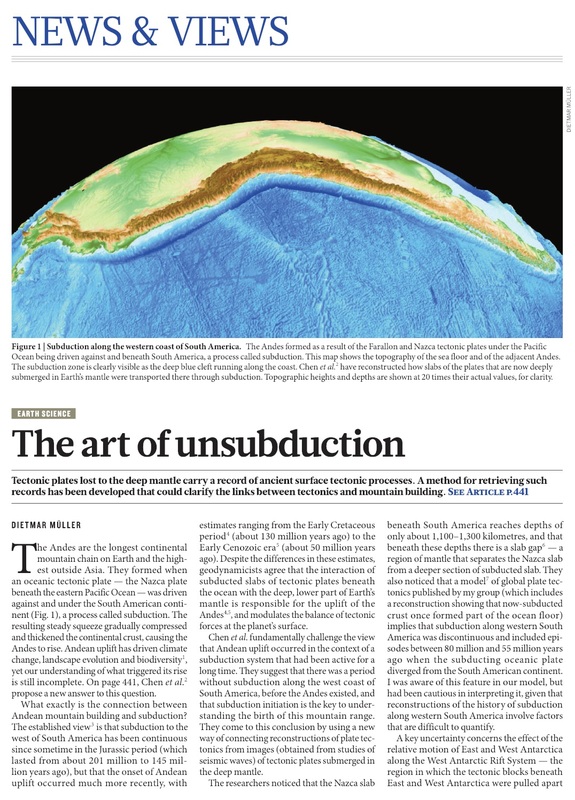 Now Yi-Wei Chen, Jonny Wu & John Suppe from the University of Houston take a fresh look at the formation of the Andes today in a Nature Article by applying the “art of unsubduction”, pulling the Farallon and Nazca plates out of the mantle on a virtual globe. This allows them to read the memory stored in these ancient tectonic plates lost to the deep mantle. An accompanying News and Views piece by Dietmar Muller explains how this black art works. The pdf file can be accessed from this link.